I’m a snoop. I’m not a gossip, just a snoop. I love seeing little insights into people’s lives. Nothing that would spell tragedy for anyone. I don’t need to know your terminal diseases, your relationship problems, or anything that would cause anyone pain. I’m one of those people who doesn’t mind you posting on Facebook or Twitter where you’re checking in at, what you’re watching tonight on t.v., or what you are cooking for dinner. If you share on Facebook you’re at a restaurant, I might think, hmm, I may have to try that one, they’re there a lot or I didn’t know she wore that lipstick. Several times on the Fedora Lounge people have revived a thread asking about the contents of their handbag. Well, in the interest of sharing, I thought I’d reveal the contents of my vintage bag (vs. everyday bag) so you can snoop into my life too. My everyday bag is boring and very utilitarian. Nothing very revealing to be seen there. I bring the same bag every day because I’m too lazy to switch it out. But my weekend bag is another matter. Since I only do vintage on weekends, this is the time for me to play and explore. I coordinate my bag to what I’m wearing, both in color and era. The contents of my vintage bag remain, however, pretty consistent. I just transfer the contents from one purse to the other. 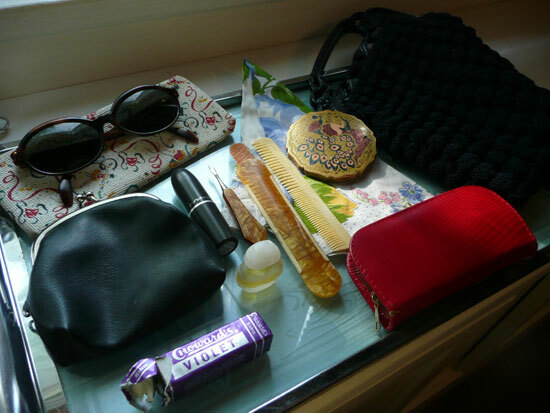 Below are the usual contents for my vintage bag. 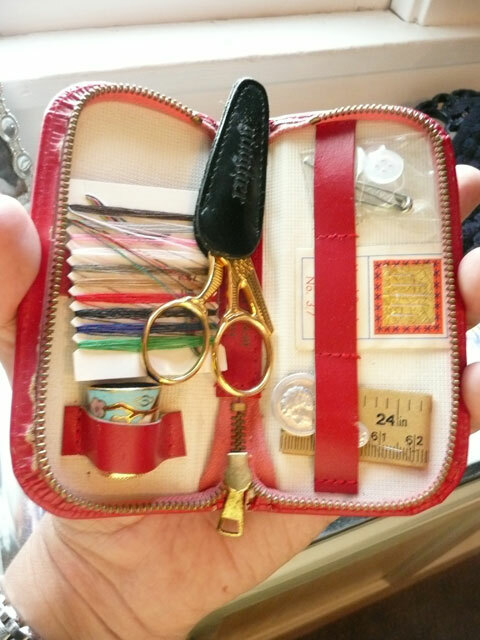 My sewing kit is invaluable for those inevitable blow-outs you sometimes experience when wearing vintage. Nothing a little needle, thread and safety pin can’t handle. It’s nice knowing you’ve got the peace of mind in your purse rather than fretting your seam is going to bust open and reveal your unmentionables, and needing to leave wherever you’re at in a hurry, blushing in embarrassment. My handkerchief is not used for what you may think. I don’t use it for Kleenex. I actually use it for itches. Itches?! When I wear vintage, I’ll sometimes include gloves. It is amazing, I’ve found, how often I touch my face in the course of a day. Depending on which study you read, you touch your face on average 16 times an hour. When you’re wearing vintage gloves and don’t want to muck them up with makeup, this can become a real issue, as removing them each time you get an itch is bothersome. My thought process usually runs through this dialogue when I have an itch. If that isn’t a sneak peak into the inner thoughts of a lady, I don’t know what is. To alleviate all of this back and forth of putting on and taking off your gloves, I just grab my hankie and make some random poorly-veiled swipes at my face so I don’t look like my faux-Rhodesian Ridgeback with a case of the mange. I like to say it looks a little more proper, but I could be delusional. So, those are the contents of my little bag. What’s in your wallet? Drivers license and debit card–always. Usually a compact with powder. Red lipstick–another must have! Liner pencil is often in there. iPhone. Fountain pen. Calling cards. Checkbook (just in case, purse/clutch-size permitting). Come to think of it, I usually have at least two shades of red lipstick. Oh, and sunglasses. I did one of these posts a while back! I'm one of those nosey people too! I love your compact by the way, it's gorgeous.